We have “Service Guides” that contain just about all the information you need to follow the service, including cues about when to stand, sit or kneel. Kneeling is always optional, as are other gestures that some may use such as making the sign of the cross during some parts of the service. Additionally, each week, the ushers pass out the “Grace Weekly” bulletin. This contains parts of the service that change week by week, such as Scripture readings, prayers and hymn selections. We invite you to take Grace Weekly home as it has announcements, names of folks we are praying for, and contact information for the parish. Hymns can be found in the Red hymnals in the pew racks. ​Our ushers and often those around you are more than happy to guide you through the service. We encourage you to contact the Rector or the Parish Office with specific questions. Yes! Children are welcome throughout the whole service, and we know they sometimes cry or make other noises – no problem! We have activity bags that an usher can give you. A nursery is also available between 9:15 until the 10:30 am service ends. Yes. The Episcopal Church believes that God’s welcome is for all Christians who seek a closer relationships with Jesus. If you prefer not to receive, you may also come forward for a blessing from the priest by crossing your arms over your chest. We always have gluten-free wafers available. What do Episcopalians believe, anyway? I am hearing impaired. Do you have hearing assistance devices? Yes! Simply let the usher know, and we’ll be happy to lend you one for the service. 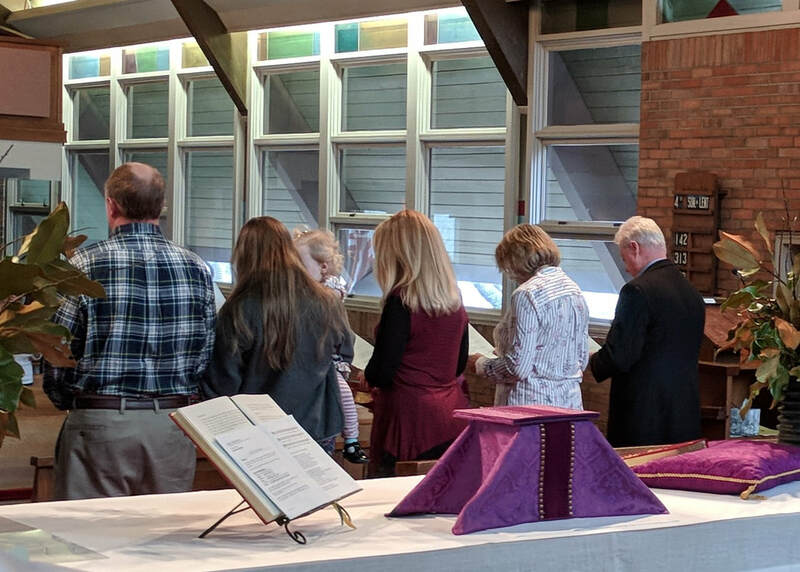 If you are or were a member of another Episcopal congregation, were ever confirmed in an Episcopal Church, or are from another province of the Anglican Communion, you can transfer your membership. You are asked to provide the name and location of the church and approximate dates of your membership or, if you were confirmed there, the approximate date of confirmation, and we will send for a Letter of Transfer. If you are a member of another Christian denomination and were baptized with water in the name of the Father, Son and Holy Spirit, you may become a “baptized member” of Grace Church after providing your birth date and place and your baptismal date and place. How can I/my child be baptized? How can I become a confirmed Episcopalian? Confirmation is an important sacramental rite in the church and is a step one can take to make a “mature public affirmation of their faith and commitment to the responsibilities of Baptism and to receive the laying on of hands by a bishop.” (Book of Common Prayer, page 412.) Those interested in being confirmed prepare by participation in seasonal Inquirer/Confirmation classes. These classes are facilitated by the Rector. It is important to note that while any baptized person can become a member of Grace Church and bear a majority of rights and privileges, she or he is required to be confirmed or received from another Christian tradition in order to become a confirmed Episcopalian and serve in certain leadership roles. Many often attend Inquirer/Confirmation classes to explore what they may or may not have learned and often to reaffirm their faith. Inquirer/Confirmation classes are designed to provide an overview of the Episcopal practice of the Christian faith and prepare youth and adults to be confirmed, reaffirmed, or received by The Episcopal Church from other Christian traditions or religions. What are the expectations of members of Grace Church? The Book of Common Prayer says that the duty of all Christians is to “follow Christ; to come together week by week for corporate worship; and to work, pray and give for the spread of the kingdom of God.” The Episcopal Constitutions and Canons specify that to be a voting member of a congregation, one must, for six months prior to a parish election, be a regular worshipper at the parish and a regular contributor to the current expenses of the parish. Most members make an annual pledge of financial support to the operating budget during the annual fund campaign or at any time during the year. To make a financial pledge to Grace Church, please speak with the Rector. A member in good standing is one whose baptism is entered in the parish register (through one of the means described above), who worships regularly and who is a contributor of record (by pledge or other identifiable contribution) to the general support of the parish. Confirmed members in good standing are eligible to serve on the vestry and vote at the Annual Meeting of the Parish.